Col. Sani Kukasheka Usman, Abuja: Following credible information on the presence of Boko Haram terrorists, their camp and other facilities at Chukungudu, a carefully planned and deliberate attack comprising troops of 3 Battalion, 22 Brigade Garrison, and 153 Task Force Battalion of 7 Division and 8 Task Force Division as well as Nigeria Air Force Intelligence Surveillance Reconnaissance (ISR) and some Civilian JTF, was carried out on Boko Haram terrorists stronghold and camp at Chukungudu on Friday 3rd June 2016. 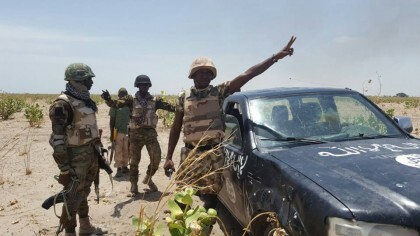 While advancing to the location, the troops encountered Boko Haram terrorists ambush positions at Muskari, Gilam and Hausasi before descending on their main objective at Chukungudu. During the encounter at the camp, the troops killed 19 Boko Haram Terrorists including their notorious leader in the area called Ameer Abubakar Gana. They also discovered and destroyed the terrorists Improvised Explosive Devices (IEDs) making factory, discovered and successfully detonated 4 primed IEDs. The troops also recovered 2 Anti-Aircraft Guns, 1 AK-47 Rifle, a Pistol, 1 Rocket Propelled Gun (RPG) Bomb, 1 AK-47 Magazine, 267 rounds of 7.62mm (NATO) metal links ammunition and 23 rounds of 12.7mm belt ammunition. Other recovered items include a Canter truck, 1 Gun truck, 1 Land Rover vehicle and a Toyota Hilux vehicle. Unfortunately, 2 soldiers suffered gun shot wounds as a result of enemy action. However, it is gratifying to state that both of them are very stable and responding to treatment at the Field Ambulance.